Something incredible happens when truly heirloom designs make their way into the hands of our dedicated Amish woodworkers. 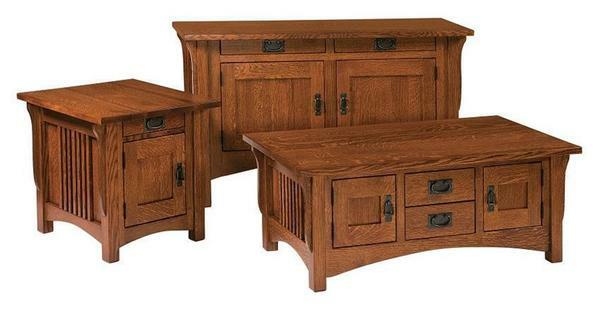 This Logan Sofa Table - built to order from solid wood to a design that breathes new life into the deeply American and truly traditional Mission style of furniture - is a shining example of that magical union between true heritage and true integrity. From its arrow-straight legs to its thick top and distinctive slat-enclosed sides, the Logan speaks to the very best in handcrafted home furniture. Select your perfect wood and stain from the menus above to start your Logan order. If you have any questions at all - or if you would like to see any free samples of any of our materials - please don't hesitate to get in touch with us by phone or by email at any time. We love the effortless versatility of this piece, and we would love to talk with you about the truly heirloom beauty that it brings to the home.